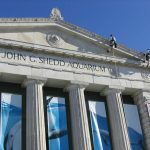 Shedd Aquarium was the gift of John G. Shedd to the city of Chicago. Designed by the Chicago architectural firm of Graham, Anderson, Probst & White in 1925, the aquarium was opened in May, 1930. 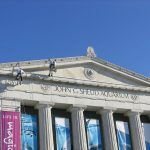 The building is situated in the Museum Campus area of Grant Park, adjacent to the field Museum and near the Adler Planetarium. 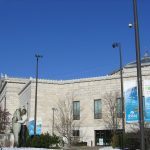 Like the Field Museum, Shedd Aquarium was designed in the Beaux Arts style, with classical Greek forms and ornamentation. The original building consisted of a central eight-sided rotunda with projecting wings at the cardinal directions. In 1991, a new structure, the Oceanarium, was added on the east side of the building engulfing the original east wing. The exterior of the original building is constructed of masonry, with cast lead ornament at the roof of the rotunda. Most of the exterior masonry, including the Doric columns at the main entrance on the west façade, is white marble from Georgia. Terra cotta is used at the cornice throughout the building and for decorative panels on the porticos of the north and south wings. 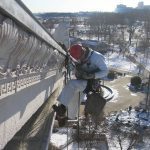 Close visual examination and hammer-sounding of masonry at exterior façades. 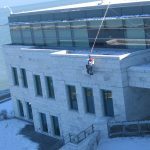 Provided training and guiding of project client to perform hands-on inspection of representative areas of façades.